Staff Sgt. 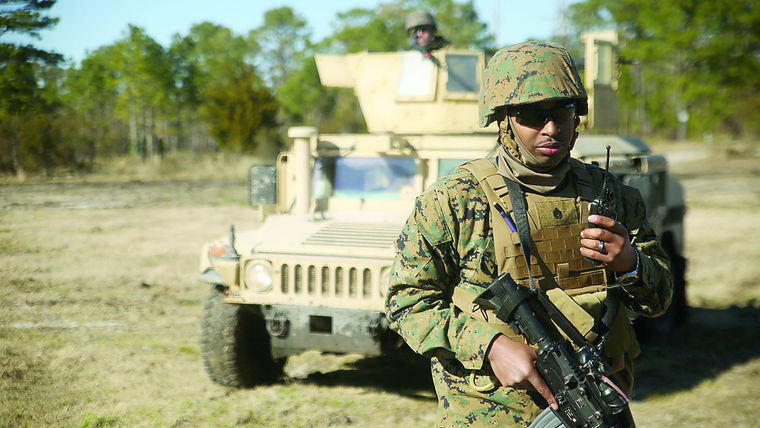 Christian T. Todd, a platoon sergeant and assistant convoy commander with Combat Logistics Battalion 6, calls his convoy on the radio during an exercise at Marine Corps Base Camp Lejeune Feb. 11. The Marines encountered opposing forces during the convoy and faced both small arms and indirect fire. Marines and sailors with Combat Logistics Battalion 6 conducted logistics convoy operations training at Marine Corps Base Camp Lejeune, Feb. 11. Each convoy included four Humvees, two MK23 7-Tons, and one MK36 Wrecker, all with mounted machine guns. The mission of the exercise was to recover disabled vehicles and the Marines operating them. "My task during the training was to recover a downed vehicle whether it goes down due to standard mechanical errors or if it is impacted by indirect fire or (an) improvised explosive device," said Lance Cpl. Brandon C. Waples, recovery team leader in the exercise. "The downed vehicle during our convoy was having mechanical issues and was no longer operable. We had two Marines in the vehicle so we had to make sure we can recover them without any hazards and get the vehicle back to base so we can get it worked on." Conducting these convoy operations includes driving vehicles in a formation from one destination to another, while facing a notional opposing force. The Marines were ambushed twice and had to respond quickly and effectively to continue on with the convoy. They faced internal communication challenges as well as small arms fire, IEDs and indirect fire. "As we were pulling up to the (landing zone) we had eyes on the downed vehicle as well as civilian(s) close to the vehicle, walking around, so we set up a 360 degree security by placing our trucks in tactical positions to have proper security over the downed vehicle and the wrecker support," said Waples. Once the opposing force was defeated the Marines called in for wrecker support and recovered the vehicle as they returned to their forward operating base, Landing Zone Egret. "This training is important to the mission of CLB-6 and (2nd Marine Logistics Group) as a whole because as motor transportation this is what we do," said Staff Sgt. Christian T. Todd, platoon sergeant and assistant convoy commander for the exercise. "We provide logistic patrols and resupplies, so we are the ones that resupply these other units and take care of possible downed vehicles that need to be recovered." Back at the FOB, the Marines discussed the training event to determine what worked well and what they need to improve. "The training went excellent. It was an opportunity to come together as a young platoon and use our skills from personal training and benefit off it as a whole," said Todd.